It's July here, and summer is in full swing. 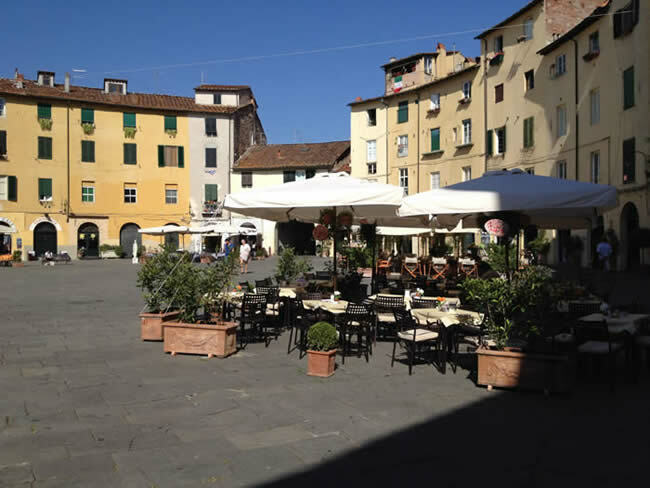 I'm in Lucca Tuscany at the moment. We have about 40 guests staying in various villas this week, everyone is having a blast, and the weather has been beautiful. It is reaching the low 90s in temperature during the day. 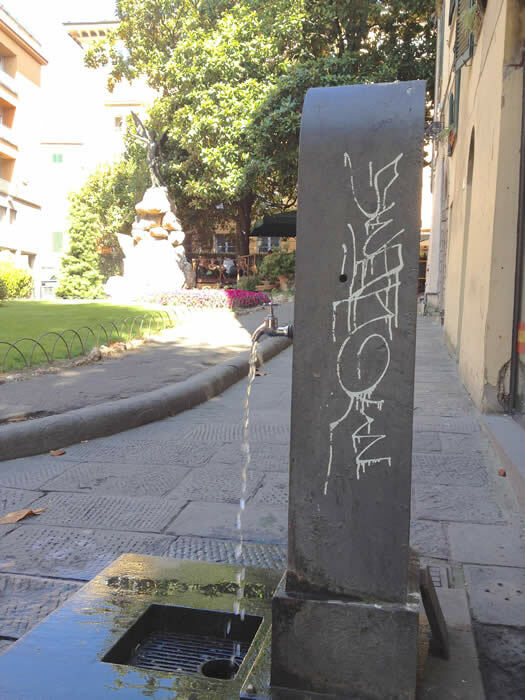 I thought I'd explain the Italian way of dealing with the heat --- water, shade and taking it easy in the midday sun! 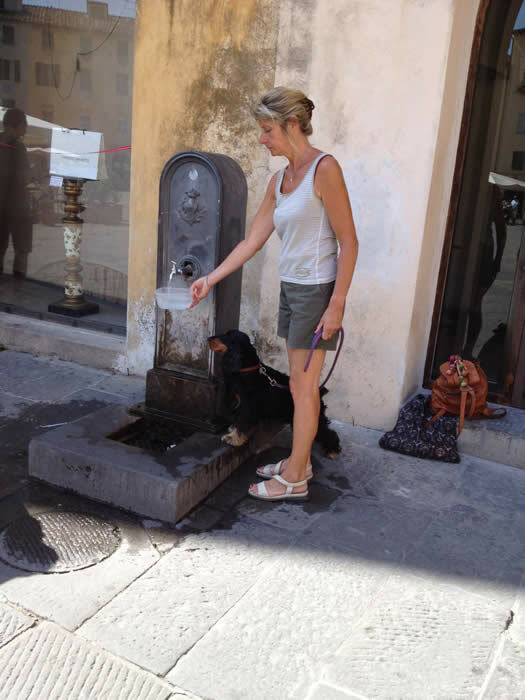 HOW IN THE WORD DID PEOPLE USED TO GET DRINKING WATER IN ANCIENT LUCCA TUSCANY? 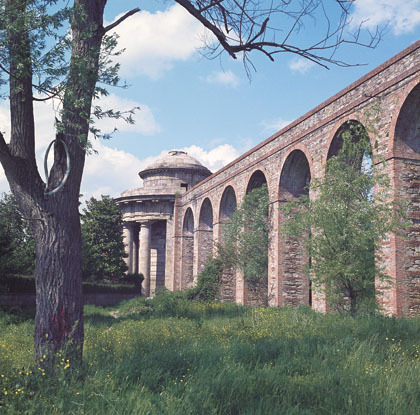 The Romans had a series of small aqueducts, running from the river and hills north of Lucca to the city. These are all gone now, except remnants in a few archeologicals digs. 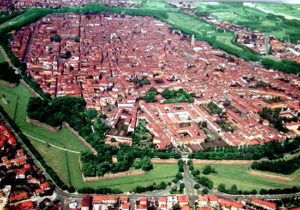 By the Renaisannce, and throught the 1600s, Lucca was hard at work expanding the size of the city walls. 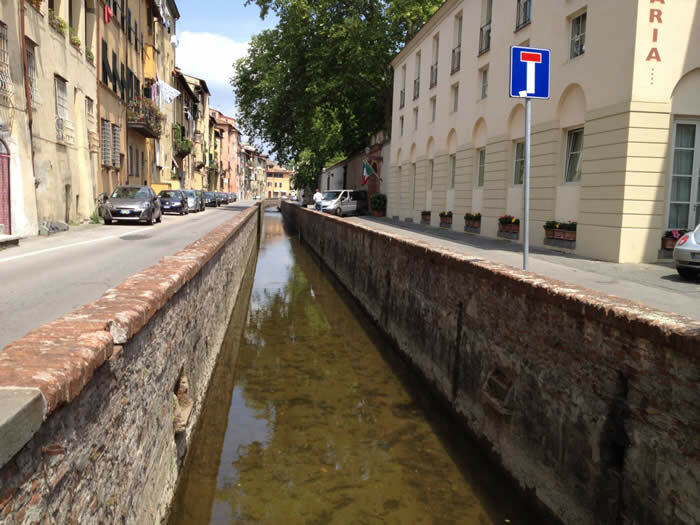 Part of this project included digging a canal from the nearby river, to route river water through the heart of the city in a canal. This running water is still there and full of fish. Its a massive structure. 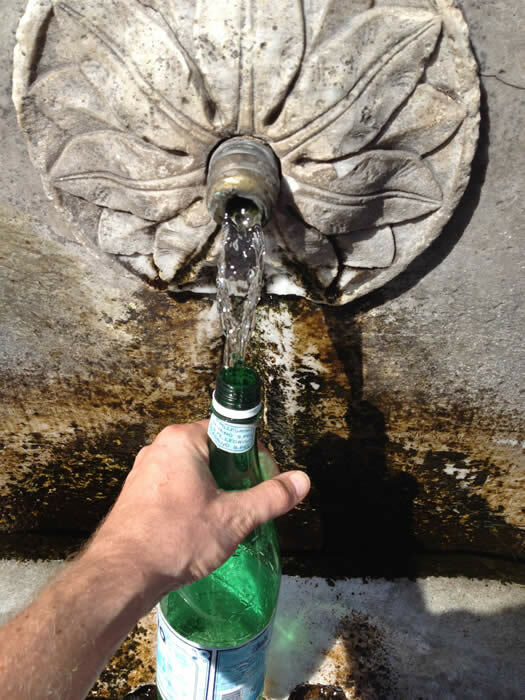 It starts in the mountains south of the city, where water from 18 cold springs in collected. It then runs 2 miles long to the city, with 460 arches, averaging 40 feet high. 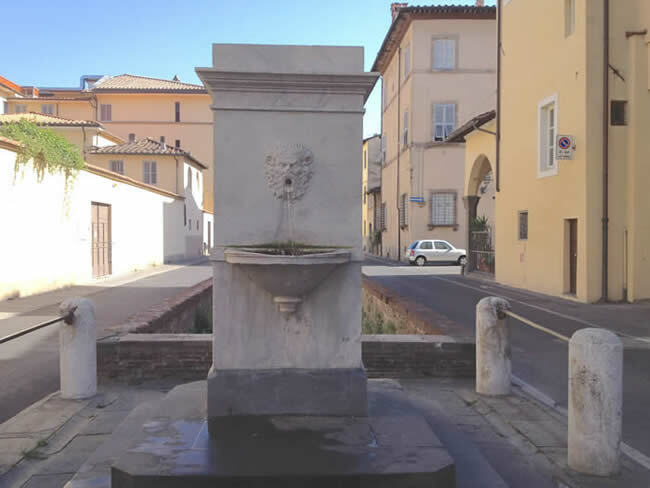 Just outsive the city, the water is piped underground, and then routed into the city, where it flows constantly from a number of public fountains. Here's the one by my house....I took these photos today, and you can see the water pouring out. In the winter, water is gushing out much faster. 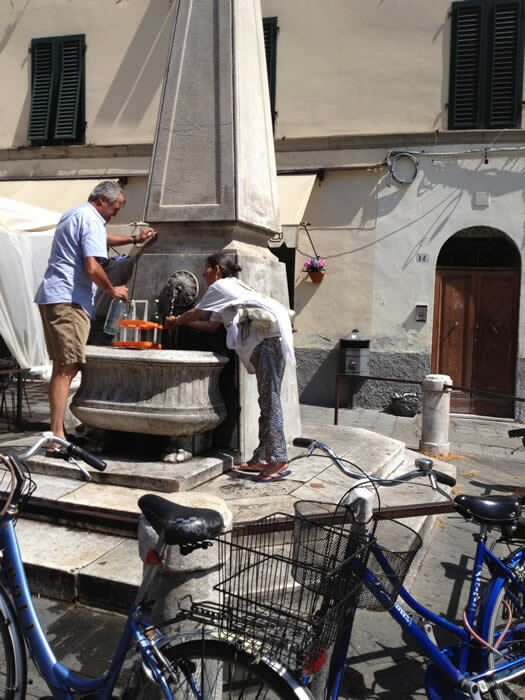 The modern public water system brings drinkable potable water to every house in Lucca. 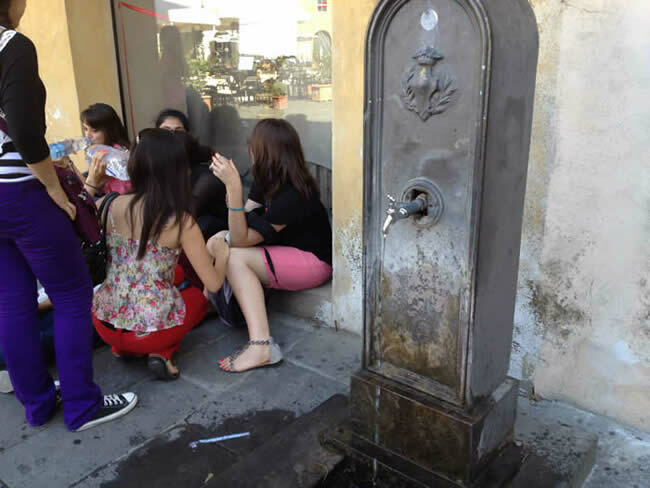 BUT, everyone says that this water doesn't taste as good as the spring water. So, for reasons of tradition, taste, fun, no one drinks from the facets at home. 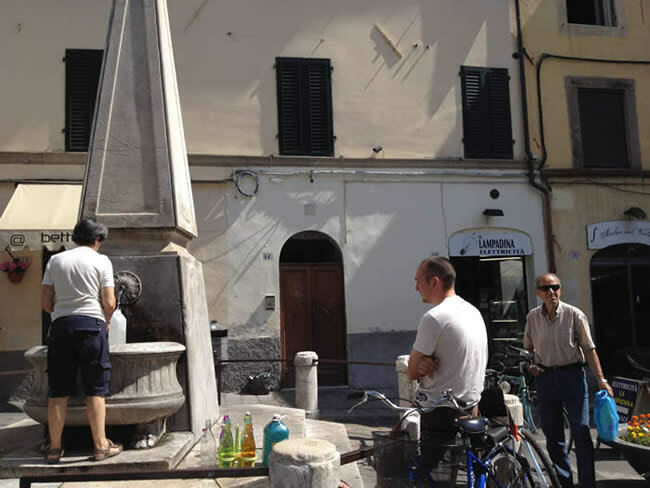 Instead, everyone goes to the public fountains and fills their bottles with fresh spring water. For one thing, there isn't a line, everyone just mills around and chats. 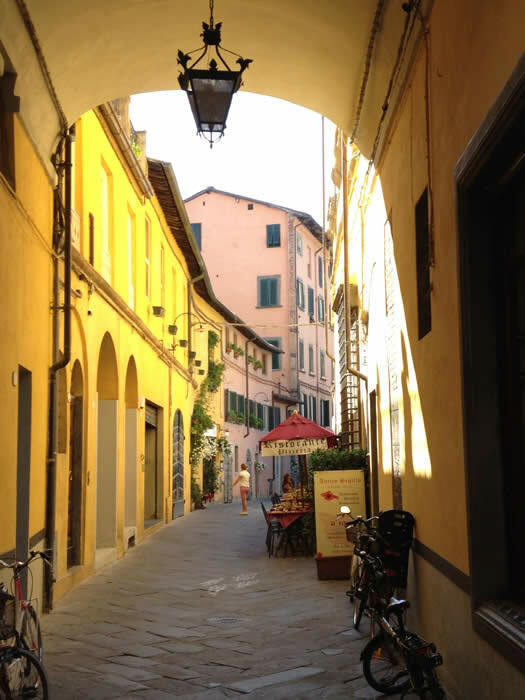 When you arrive, you ask out loud "Chi é l'ultima? ", which means "Who is last?" The last person to arrive will tell you, and you don't need to stress about losing your place in line. The other rule is my favorite. 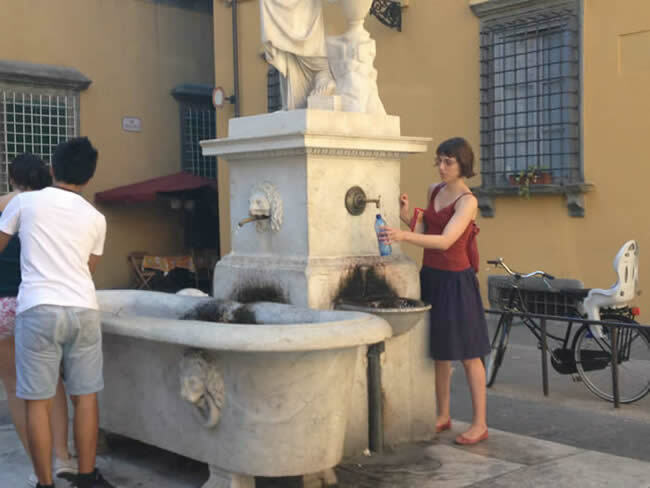 If you just want to have a drink, rather than to fill a bottle, you simply walk straight to the fountain. 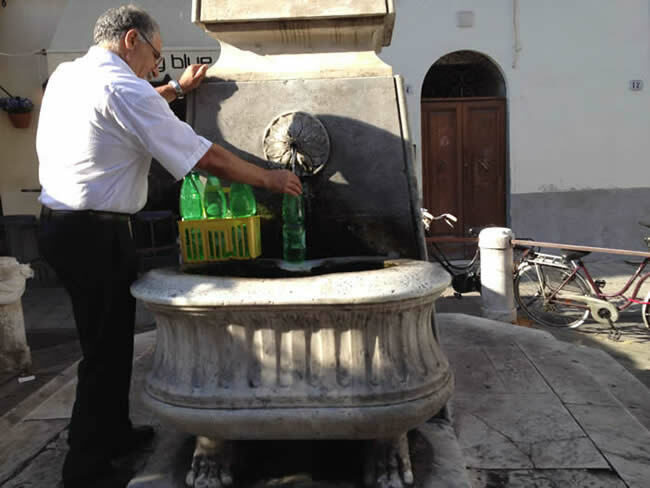 Everyone will let you pass directly to the fountain and you don't need to wait for everyone to fill their bottles. This is a well know rule everyone follows. This rule reminds me of my wonderful neighbor Rafaela, who used to insist on feeding me every time I got near her door. She was always really gracious when I thanked her. BUT, if I ever thanked her for a glass of water, she would tell me not to thank her, that water belonged to God, not her. 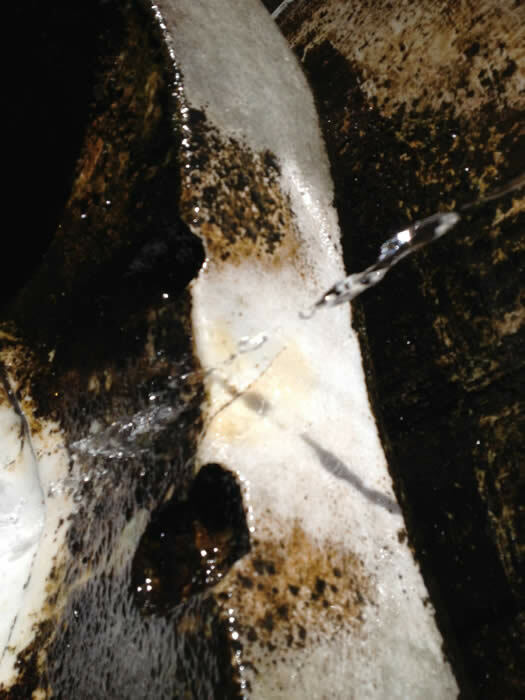 The water has been flowing so long that the marble is eroded in parts. Here you can see the summer water pouring in on the right. 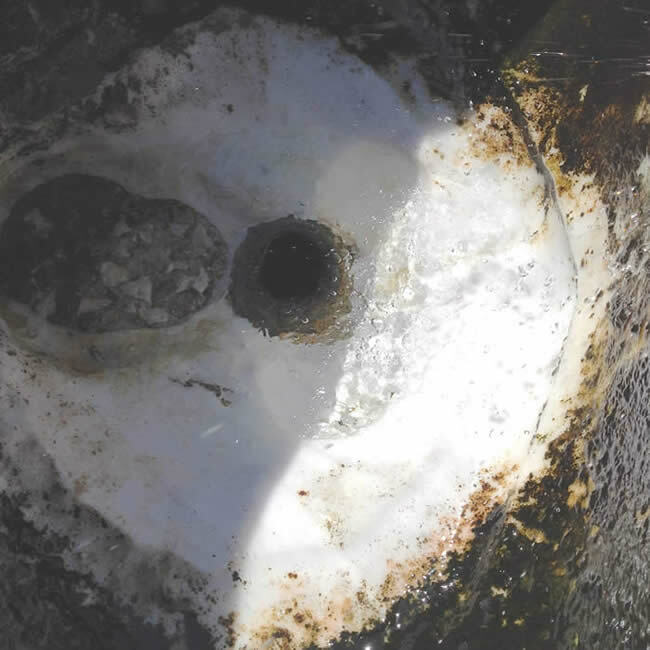 In the winter, the water flow is stronger, and lands on the left side of the drain -- you can see that the marble has been patched where it eroded through. 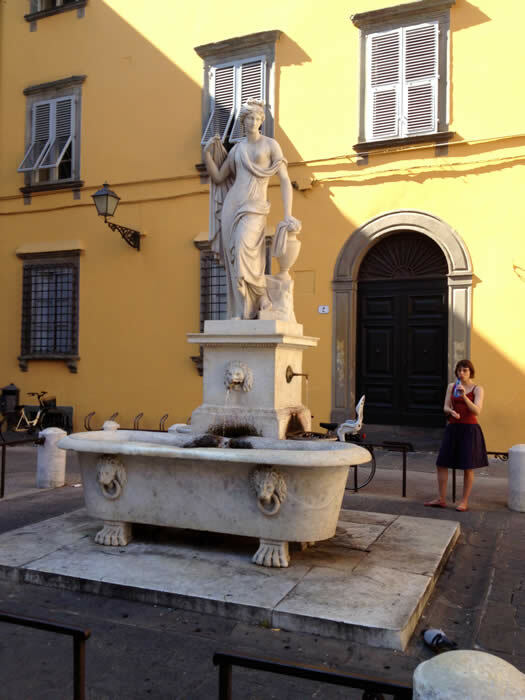 Here's another fountain. This one is called the "Pupperona" which is local slang for a well-endowed woman, because of the scandalous Janet Jackson attire. 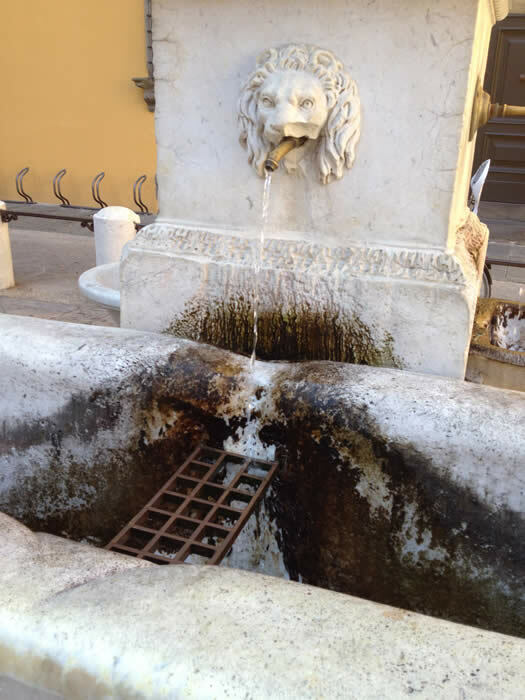 This fountain has a really old tub under it... you can see the erosion. And at some point, a brass grate was added. This is used to set your bottles/jugs on, so you don't need to hold all that weight while you fill them. 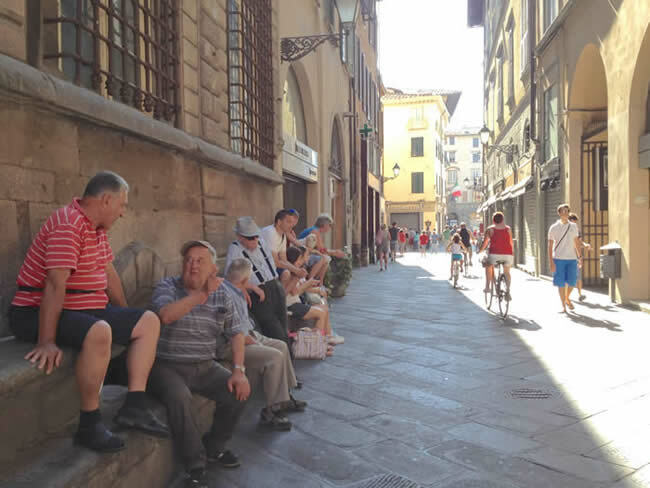 There are coffee shops about every 50 feet in Lucca, and the shopkeepers at the various shops, have standing orders with the coffee shops. 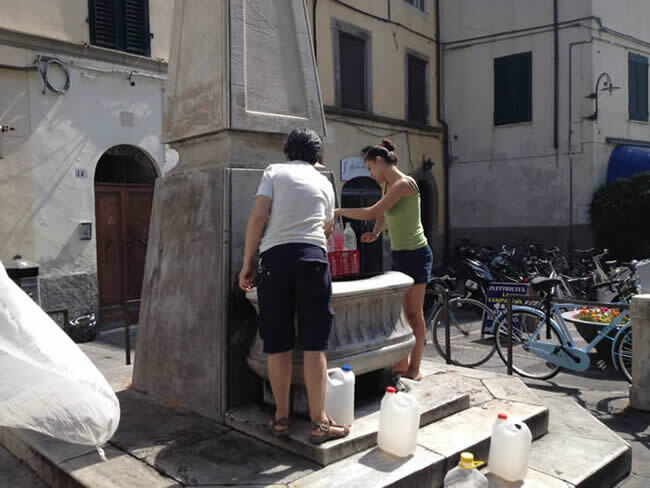 So every day at an appointed time, the baristas will deliver coffee, or a bottle of water, to the various shopkeepers on trays. 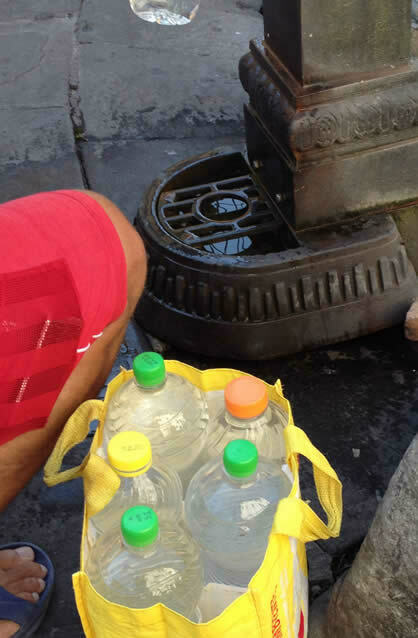 So on a hot day like today, everyone is drinking lots of good water. And there are other strategies for dealing with the heat. 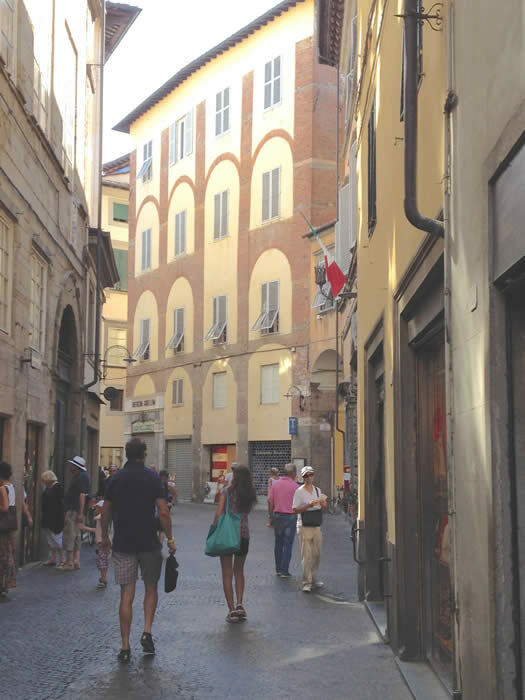 Few of the homes in Italy have air conditioning. This is because energy costs about 4x what is costs in North America. And they consider it wasteful. 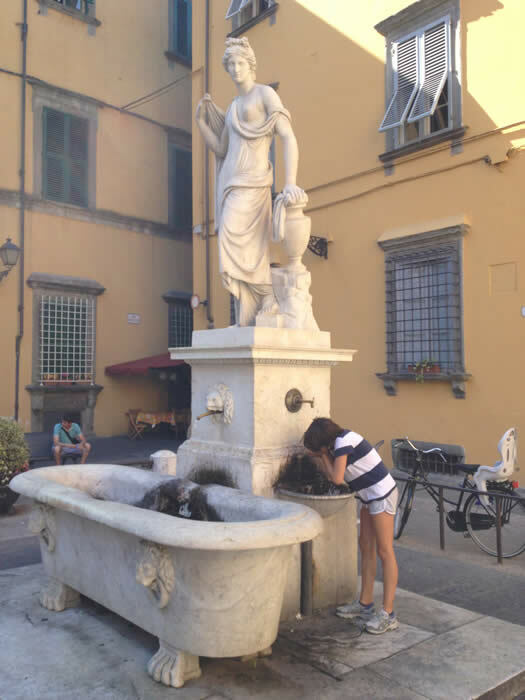 And, with the thick stone walls of the buildings, there are simple ways to stay cool without it. 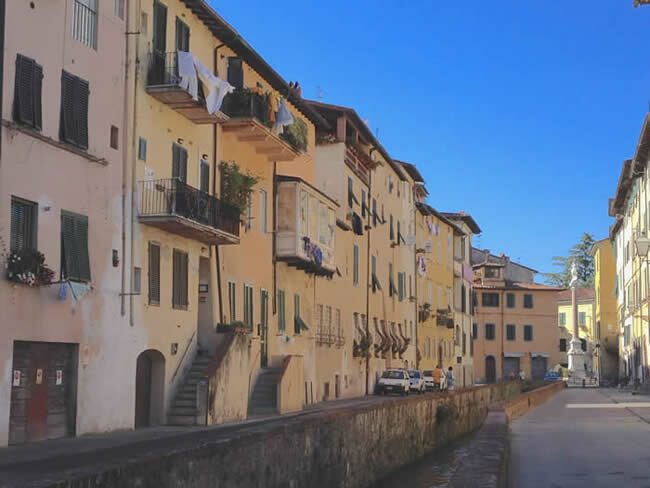 The first is to open the windows at night, when the temperature, even in the summer, drops into the low 70s (Lucca is about 10 miles from the Medeterrainian Sea, so it is pretty moderate). 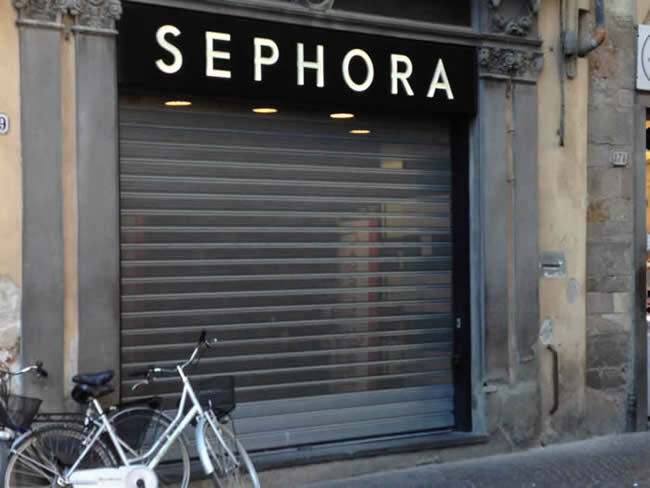 Then, in the late morning, all the windows are closed and the shutters too. With the thick walls, it stays fresh and cool inside. 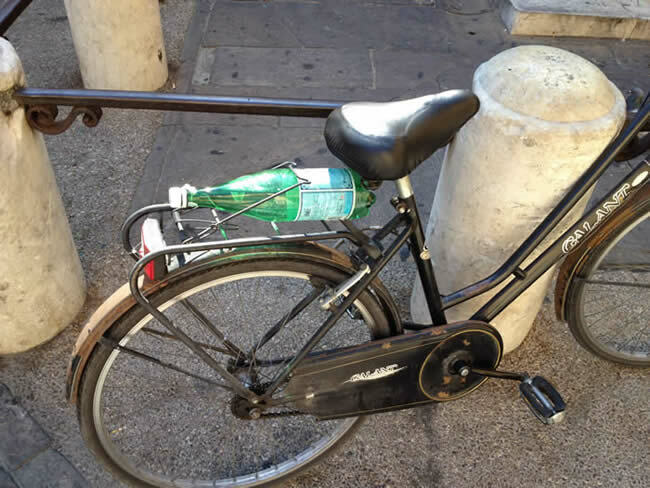 It is about 2pm when I'm out to fill my water bottle. Notice the windows on the building ahead. 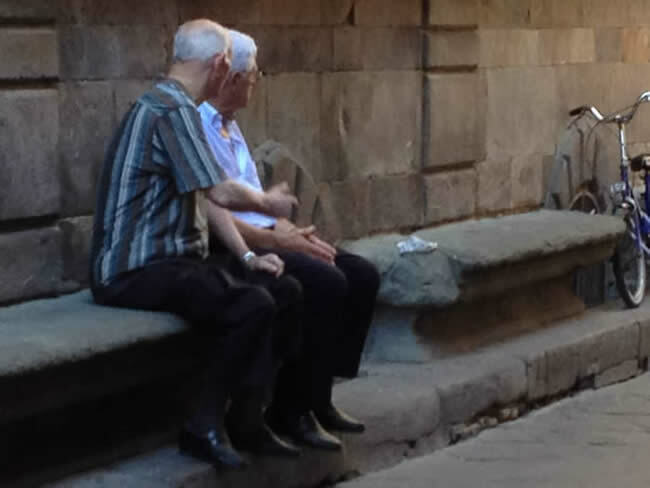 And the people that do stay outside during the midday pause? Well, they seek cool spots, and just relax. 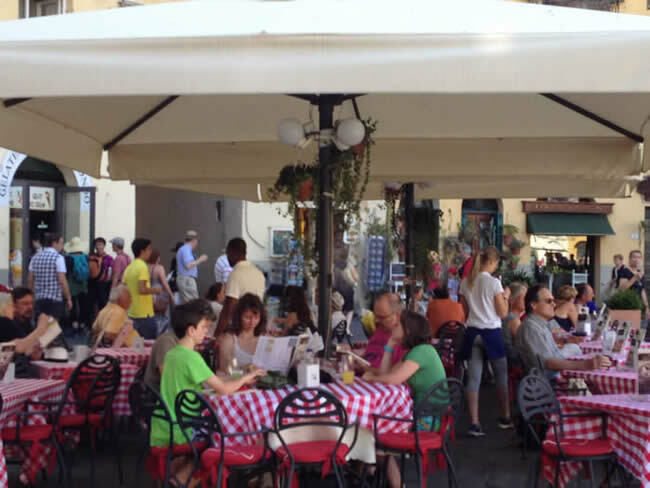 And to my immediate left, a cafe which happens to be in the shade at the moment. 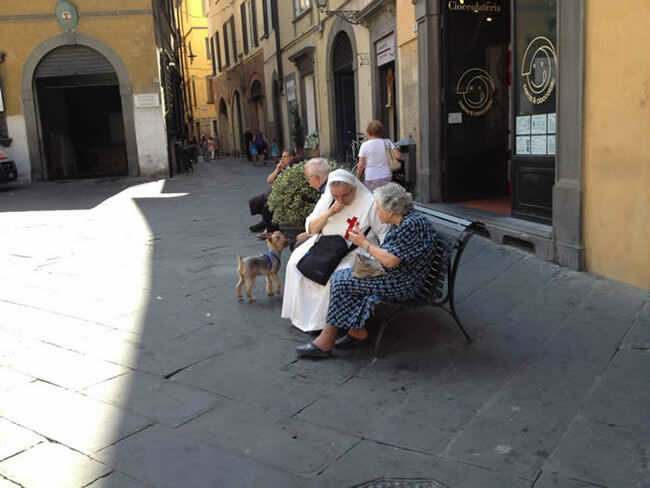 This spot is a favorite for the early afternoon. 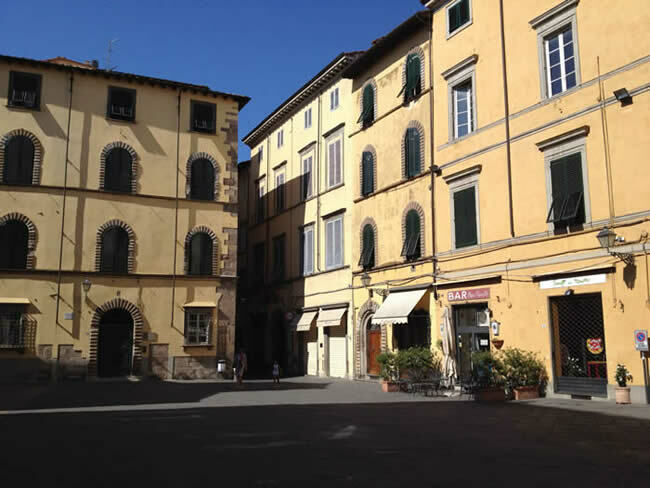 It stays shady, and across the street is the OVS clothing store, which is big and has air conditioning, so the cool air wafts out into the street. There is always a group of men here. 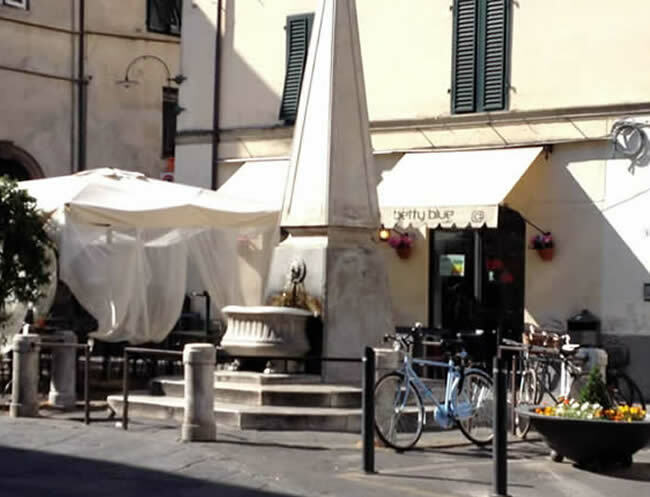 Like air conditioning, clothes dryers are rare in Italy -- why run a dryer when there is the sun? ... and head back to my own shuttered and cool apartment to have a nice cold drink!!!!!!! I'll come out again at 5PM, when my work is done and it is still sunny but cool. 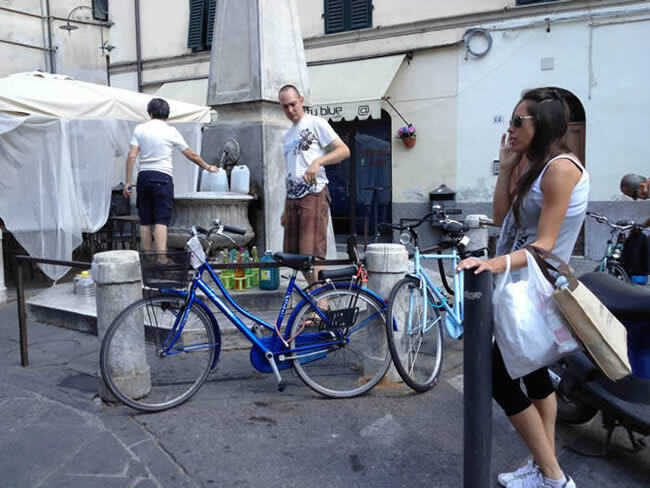 All the shops and restaurants will be open, the streets will be bustling with people and bikes. Summer is fantastic here.